Last week I wrote about QR codes, what they are and how they might be used in your classroom. QR codes can be a powerful instructional tool, mainly because they can capture and display various types of content to devices that are rapidly becoming the computer of choice for younger people–mobile phones. Statistics on mobile phone usage among teens are not very surprising. Mobile phones are becoming so ubiquitous that only 9% of American teens would be willing to go without their cell phones for 24 hours (30 Hour Famine 2011 Survey, January, 2010) and more than 4 in 5 teens sleep with their phone on or near their beds (Internet and American Life Project: Teens and Mobile Phone Survey, June 26 – September 24, 2009). With the average child spending an hour and a half texting each day (Kaiser Family Foundation study, Generation M2: Media in the Lives of 8- to 18-Year-Olds, January 2010), it doesn’t take a rocket scientist to understand why texting has now surpassed face-to-face interaction among friends. However, the statistics also reveal some interesting usage trends. Teens use their cell phones mostly for text messaging, taking and sharing pictures, playing and recording music, and playing games. 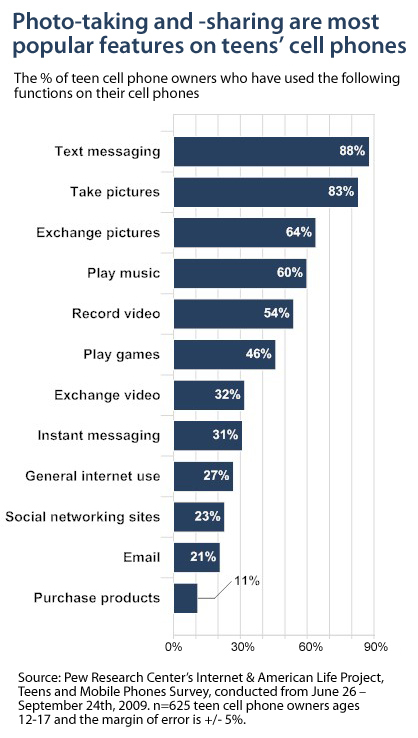 Instant messaging, general Internet usage, and email are at the bottom of their list. That might be why younger students don’t respond to instructor emails–heck, they aren’t even reading them. Why Use Mobile Technologies in the Classroom? These statistics illustrate more than ever the imperative to intuitively incorporate mobile technologies into our curriculum and classroom, since students are already using these devices throughout the day. However, maybe even more importantly, by incorporating mobile technologies into our instructional strategies, students can benefit from experiencing more creative ways to use their mobile phones than just for texting and sharing pictures. QR (Quick Response) codes can display various types of content on a mobile device through the use of a QR code reader application. QR code readers seem to perform magic, as they read various types of content and then format them correctly on a mobile device. Another tool that is another form of “Quick Response” is an app called Google Goggles, now available for iPhones (iOS 4.0). Google Goggles can interpret various types of content–text, landmarks, books, contact information, artwork, wine, logos, and with some experimentation, many others–by scanning a picture you take. 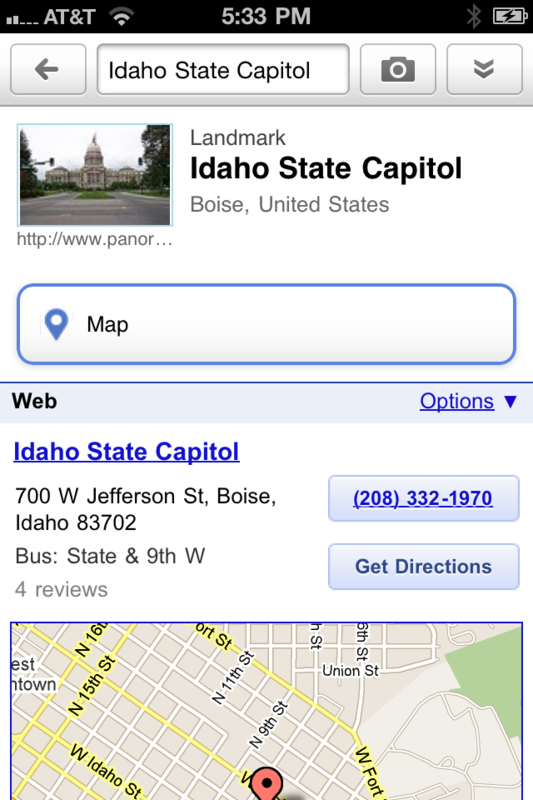 So, you might be in Boise and spot a building you might want to learn more about, such as our State Capital. You open Google Mobile on your mobile device, click the little camera icon to the left of the voice search, take a picture of the building, and then in a few seconds, Google will return a list of possible matches. You select the appropriate link, and Google returns more information, such as another picture, a web link, a map, phone numbers, directions, you name it. But of course, it gets even more exciting. Let’s say you are in Brazil and do not know Portuguese. You want to be able to read what is on the menu. You take out your mobile phone, open Google Mobile, click the little camera, and take a picture of part of the menu. 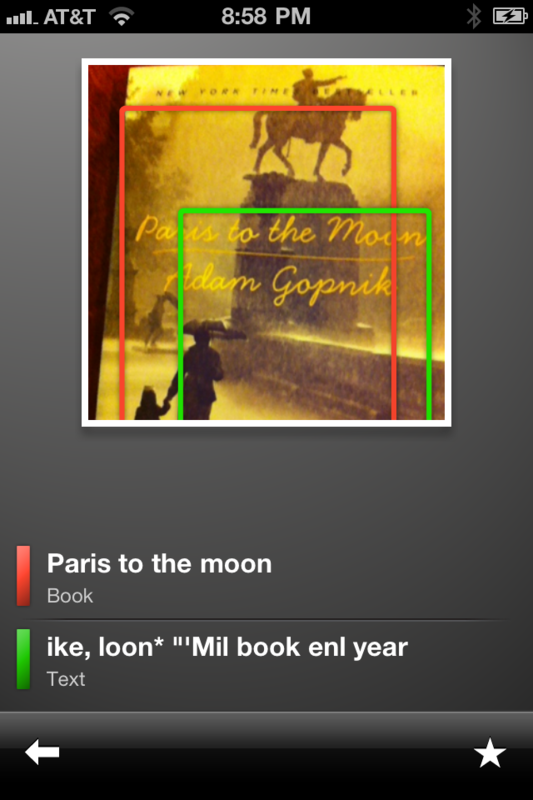 Google Goggles will recognize it as text and will ask if you want it to be translated. So, you find out “torta de maçã” is an apple tart. How useful is that? No longer will you have to jot down a book you want to read or purchase. All you need to do with Google Goggles is take a picture of the cover and it will be found. As you read through all of the items Google Goggles can scan and identify, it becomes very clear very quickly how valuable this tool can be inside and outside the classroom. How might you use Google Goggles to enhance learning? Interactive Museum Tour: Students could find out more about specific artwork, researching it with Google Goggles, then recording their reflections to DragonDictation on their mobile devices (speech to text translation). These text files could then be sent to a student’s Twitter account, adding text hashtags to easily sort these later. Additionally, students might send their texts to the teacher’s email, as part of the assignment. Students could return to class, view the tweets through the common hashtags and discuss patterns, similarities, and differences in student perceptions of the artwork. Analyzing Multimedia Messages: By taking pictures of various advertisements and seeing which ones are recognized by Google Goggles, students could interpret popularity, identity, and other aspects of multimedia messages and advertisements. Why were some recognized and others not? A photo-collage of the various Google Goggles searches (screen captures of the Goggles search results on the mobile devices) could be constructed (how about using Glogster for this? ), with a resulting discussion and analysis of multimedia messages. Translation Help: Students might need help with understanding parts of a book and can use Google Goggles to translate a section of text to their native tongue. There are many translation tools out there, but if a student is reading from a book, this can be a real time-saver. Expanding Google Goggles: Send your students on a field trip to discover some unknown historical landmarks not recognized by Google Goggles, then have them create a blog post that includes pictures, maps, and a biographical sketch of that landmark. 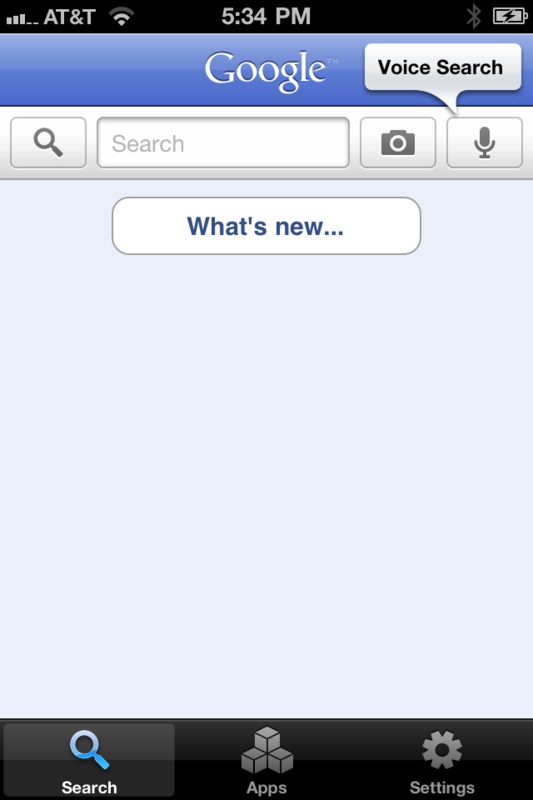 See how long it takes for their online post to show up in a Google search and also test it in Google Goggles. Anytime/Anywhere Book Lists: Encourage students to keep track of books they have read, are reading, or want to read in Google Books, along with using Goggles to take pictures of books they discover anytime, anywhere. Google Goggles and Beyond: Not all images are recognizable by Google Goggles. Ask students to take pictures of flowers, plants, animals, and other objects not included in the Google Goggles list of items and see what websites and/or images are returned. What better ways of searching for pictures taken with mobile devices might be used? What strategies might they use to locate information with their mobile device? Have a class discussion or use a forum–then ask students to post an outline of search techniques to a collaborative Google document and publish it online. So, now I have your creative juices flowing! What do you think? How might you incorporate more mobile activities and assignments in your classroom? Please post your comments below and thanks for reading. That is so cool – I love the idea of using Google Goggles for items that are not going to bring back great results. Great idea.